The djembe (pronounced ‘jem-beh’) is one of West Africa’s best-known instruments, one of the most versatile and widespread percussion instruments on the planet. This goblet-shaped drum is traditionally carved from a single piece of African hardwood and topped with an animal skin as a drumhead. You play it by hitting it with your hands and fingers. The drum is usually played in groups, consisting of other djembes, bass drums (called dun dun, dunun or djun djun) and percussion such as shakers and bells. It is often accompanied by dancing. 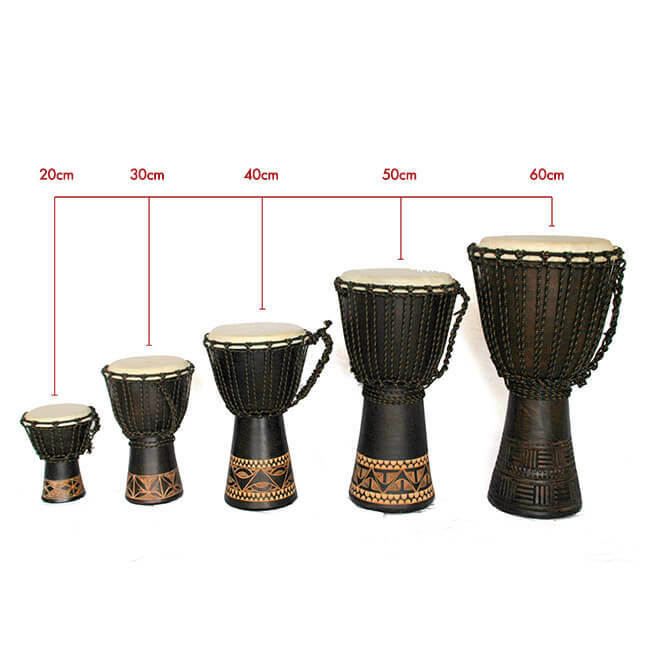 The djembe has its origins with the Maninke people of West Africa around the 1300 AD. The drum has a rich and colourful history, a tapestry of oral tradition recounted by generations of musicians and storytellers. Traditionally, the drum is more than just an instrument of entertainment. Songs and rhythms played on the drum are representative of events in the community, past and present, and a record for future generations. Available in various heights, 20cm – 60cm.